6 Years! | To Be, To Be. Tutubi. Today, I have been an adsense publisher for 6 years already, and no, I am not earning as much as I want to but as passive income go, this is not bad! 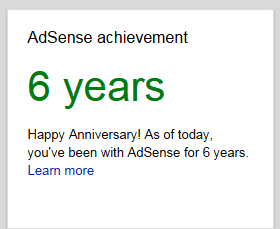 I hope to have more years and more moolah with Adsense these coming years!